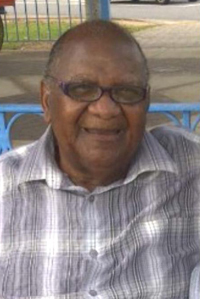 A service celebrating the life of Wellington Francis [Steve] Darrell Sr., in his 88th year of 5 Heathcote Hill, Sandy’s MA 06 will be held on Wednesday, September 19, 2018 at 2:00 p.m., Somerset Seventh-day Adventist Church, 9 Beacon Hill Road, Sandys. Interment will follow at St. Paul’s cemetery, Paget. Visitation: Relatives and friends may pay their respects at AMIS Memorial Chapel, Khyber Pass, Warwick Tuesday evening, September 18th from 7:30 to 9:00. Wednesday at the church on 19th from 1:00 to 1:50. In lieu of flowers donations may be made to LCCA. Predeceased by: Son: Collin Darrell; Siblings: Vincent Darrell, Pauline Taylor, Ismay Trott, Henry Darrell, and Llewellyn Darrell [Merry Mice].